Coral Hamaca Resort Review: Set directly on Boca Chica Beach, Coral Hamaca Resort has everything you could ever want from a resort in the Dominican Republic. 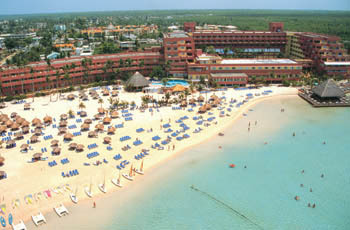 The resort is a short drive form Las Americas International Airport and Santo Domingo, the Island’s capital city. Guavaberry Golf and Country Club, 18 whole golf course is also a short drive from the resort. Golf enthusiasts should inquire as to Golf deals the resort offers. 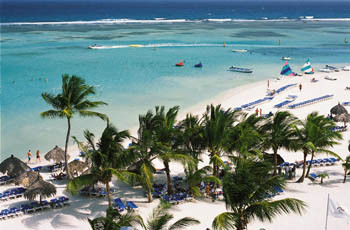 The Boca Chica Beach is made up of soft white sand and bordered by the beautiful waters of the Caribbean. 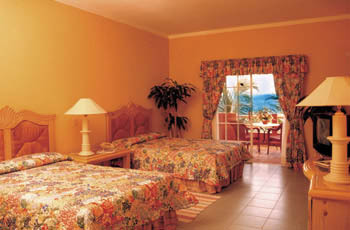 The hotel offers beach chairs and palapas to make your day at the beach comfortable and worry free. The hotel also offers 4 free form pools for adults and 2 children’s pools. Swim-up bars can be found in the pools. Nighttime fun can be had at the resort’s Casino, which offers Vegas odds, and the nightclub, that stays hopping all night long. Coral Hamaca Resort offers several different activities for all different tastes. Sports, excursions, lessons and entertainment are offered at all times of the day. A charismatic and energetic activities’ staff will keep you involved and entertained throughout your stay. Coral Hamaca Resort Review Rooms: The hotel design allows for many of the 598 rooms to have spectacular views of the Ocean, the lush gardens and pools. The rooms are equipped for your comfort. Air-conditioning, private balconies and make-up areas are a few of the luxuries provided to the guests at Coral Hamaca Resort. 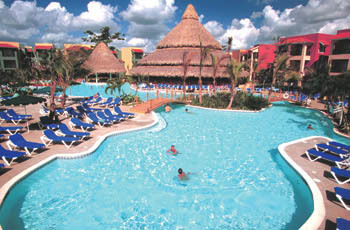 Coral Hamaca Resort Review Activities: Coral Hamaca Resort does not only deliver on the activities, it over-delivers. Guests will delight in the variety of the activities offered by the resort. The resort’s high energy lasts all day and into the night. Whether you choose to take part in the competitive team sports or the water sports you will have the time of your life. Let the Coralin Kidz Paradise Club keep your kids entertained. For a little extra adrenaline rush, and for an extra charge, try the motorized water sports like the Jet Skis or the parasailing. Coral Hamaca Resort is the perfect spot for the guest who loves to keep moving, even when they are relaxing. Coral Hamaca Resort Review Restaurants and Bars: The resort offers three restaurants and two snack bars. The buffet restaurant La Cortica is a seaside restaurant that serves three meals daily. The a la carte restaurants serve Italian and Mexican cuisine. The snack bars include a pizzeria. El Pelicano Restaurant by the sea is not included in the package. There are 4 bars throughout the resort. Unlimited domestic drinks are served throughout the day and night at Coral Hamaca Resort. Coral Hamaca offers everything you are looking for in the perfect vacation for your family, a romantic getaway, a soothing retreat or maybe you are simply looking for paradise. Anxious for your trip to Coral Hamaca Santo Domingo? Hit any of the "Get Quote" buttons on the page and we'll send you a booking confirmation form or give us a call and we'll answer any questions you may have. Let's make that dream vacation a reality - join the All Inclusive Resorts Family. Do your own Coral Hamaca Resort Review this season!